This simple math activity is from our Math Activity a Day calendar. 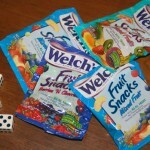 Do your kids love Welch’s Fruit snacks? My preschoolers do! I rarely keep any in the house and they love getting to go to their Grammy’s where they get a bag of the treats. As today is Friday, we decided to splurge. Get a dice, roll it. Count out the number you rolled. 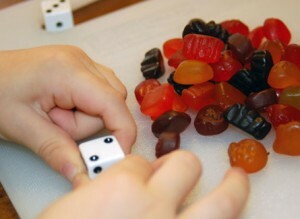 Roll the dice again and add or subtract that number of snacks to/from your pile. Do over and over again till you only have one or two snacks left in the pile. Eat those and repeat! So much yummy math fun! 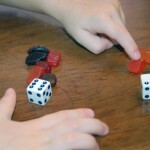 I think JDaniel would eat them before I could hand him the dice. I love math activities using food. We used to read the M & M’s Counting Book and have so much fun using real M & M’s and then eating them. This is a good idea. But maybe include a reward unconnected to food.